For weeks Mini Me would fly out of school and tell me about David Walliams new book that her teacher was reading to the class. ‘Mummy, The Midnight Gang is the funniest kids book ever!’ she would exclaim along with ‘Can we buy it Mummy?’. Fortunately for me, we were sent a copy to review for HarperCollins Children’s Books via the BritMums Book Club and upon opening the package Mini Me’s smile was brighter than Blackpool Illuminations! The new David Walliams The Midnight Gang book is aimed at children aged 8 years and above, perfect for Mini Me who has loved reading The Midnight Gang to me and having read a chapter myself I totally understand how a child can immerse themselves in The Midnight Gang because I was equally as captivated by the book. David Walliams is a wonderful children’s author, written in his unique style – almost how he speaks – he really is the child that has never grown up and proves it is the best way to live life! The illustrations by Tony Ross really do make the book though and before you dive into the story, each character’s name, part in the story and characteristics are described, giving you an image of the character before you delve in! The book has been everywhere with us, even in restaurants – it is definitely one of those books that you simply cannot put down! With Chapters including ‘Poop! Poop! And Double Poop!’ and ‘A Pain In The Bum’, it’s very easy to see how children are carried away with this book! The Midnight Gang is the latest book written by David to be released and will no doubt be on the top of many Christmas lists this year. Following on from the success of his first book The Boy In The Dress, right through to Grandpa’s Great Escape, The Midnight Gang is Walliams’ most ambitious book yet and the wait has definitely been worth it! Admittedly it is the first in his range of books that we have ever read and it certainly will not be the last! As a parent I am reassured that Mini Me will spend quality time, curled up reading The Midnight Gang as it cements her love for reading larger fiction books. The book has already had such an impact on Mini Me that she smuggles it into school each day and has even devised her own Midnight Gang game for her friends when in the playground. 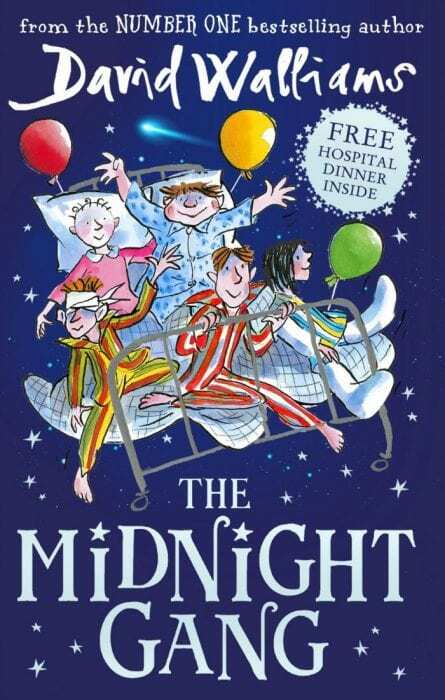 Following the adventures of five children who have found themselves in Lord Funt hospital, Midnight should be the time when most children are asleep… except the children featured in the book! It is as eccentric as you can imagine, however Walliams really does have a way of dealing with serious themes in such a way that children are entertained by the heart-warming story with the main theme revolving around friendship and helping others. At 480 pages in length, it is a hefty book for little readers who will fall in love with some characters, be wary of others and will love the fact that the Matron’s favourite chocolates are spiked so that the children can fulfil their Midnight adventures! It is light hearted, snappy, jazzy and all the things you have come to expect from David Walliams, all contained in a fun children’s book. With an RRP of £12.99 for the Hardback copy of The Midnight Gang, you can currently purchase a copy in time for Christmas from Amazon at the awesome price of £5. You can find out more information from the World of David Walliams Website where you can find lots of free activities to download in the School Zone section too! My daughter has loved all of his books but told me she felt she was getting too old for them now. I bought it for her sister instead but eldest couldn’t resist and has read it and loved it already !